Tanker 59 - 1993 Mack RD/4 Guys 500 gpm/2500 gal. With Lower Swatara’s response area being 87% hydranted, this rig is second due for vehicle fires on highways. Featuring three 10” electric dumps, it is equipped with two SCBA, 400 Mhz & UHF portable radios, two 200’ 1-3/4” pre-connects, a 100’ 1-3/4” trash line, 200’ 3” pre-connect, 25’ 5” pony length, 3” hard sleeve, a chainsaw, drafting equipment & adapters, submersible & trash pumps and a 3,000 gallon portable folding tank. 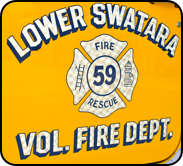 Organized in 1956, Lower Swatara provides Fire & Rescue protection to Lower Swatara as well as sections of Londonderry, Middletown & High Spire. Forty active volunteers (including live-in members) respond to an average of 600 alarms annually. 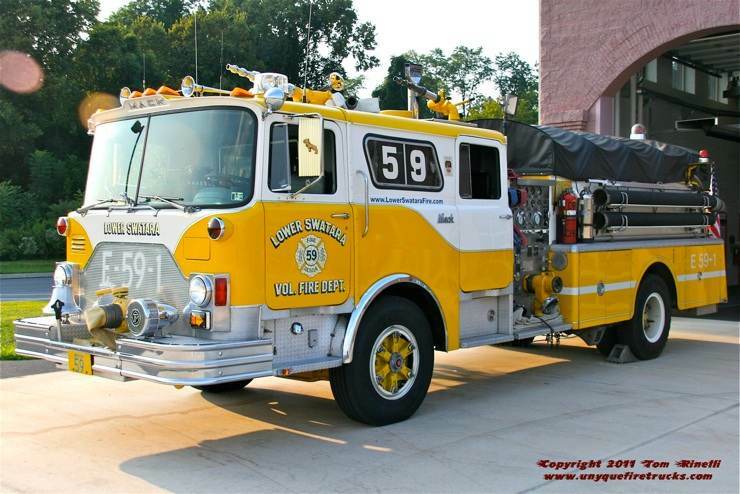 Having replaced a 1975 GMC/Hamerly rescue, this rig has quite a story & is what prompted me to visit Lower Swatara to document a piece of firematic history that is soon to be retired. Beginning life as a Mack pumper built for the FDNY, it served originally during “the war years” as Engine 82, the company made famous by the classic fire service novel “Report from Engine Co. 82” written by Dennis Smith (who actually rode this rig for a short while before being transferred out). 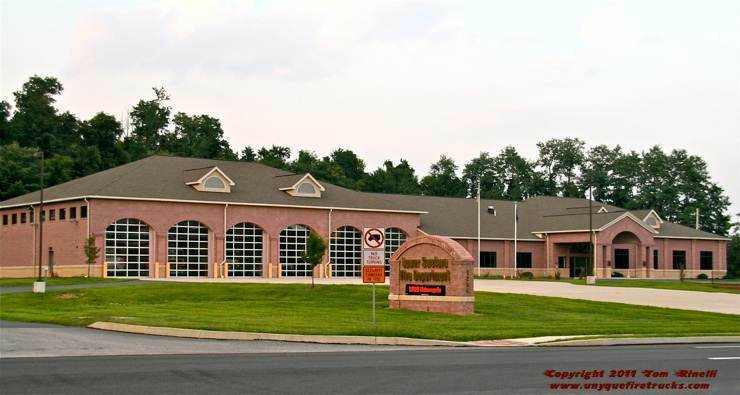 Later serving as Engine 238 & Reserve Engine 511, it was picked up by the Progress FC outside Harrisburg (PA) where it operated for two months before the company decided it did not meet their needs. 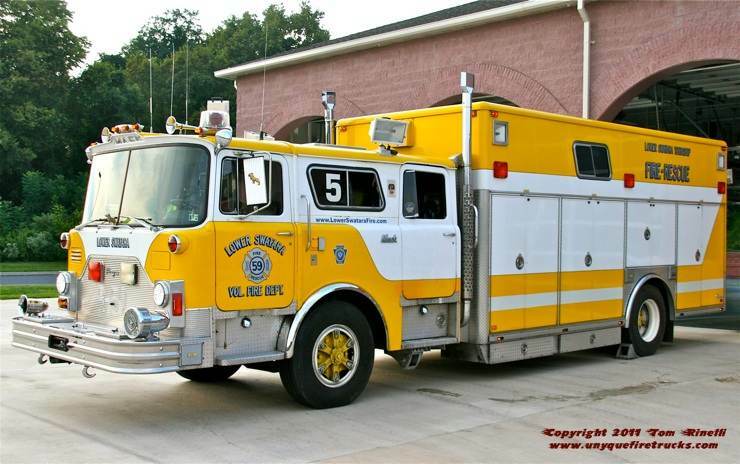 Lower Swatara FD then acquired the rig and had Interstate Mack refurbish the cab and extend the chassis upon which Ranger Fire Apparatus built a 20’ aluminum walk-in rescue body. Seating six, it features front & rear winches, a 20KW PTO generator, laptop computer,, a 200’ electric cord reel, four 200’ hydraulic reels, six 6,000 PSI cascade cylinders with fill station, an “M” oxygen cylinder with multilator and a 3.5KW portable generator. Its’ equipment complement includes eight portable radios, seven SCBA with 4 spare cylinders, a full Amkus extrication tool system including two spreaders & cutters (one of each pre-connected), three rams, air bags, cribbing (including 8x8’s), gas & electric portable power units, bottle jacks & struts, a 4 ton porta-power, reciprocating & rotary saws, a “slice pack”, rope rescue gear and BLS equipment including oxygen, an AED and nine backboards. After a total of 36 years of active front line service, this classic rig is due to be replaced in 2012 with the assistance of a $400,000 state casino gaming grant. Engine 59-1 - 1978 Mack CF 1250 gpm/750 gal. Custom built for Lower Swatara, this rig was replaced in 2012 with a Ferrara Intruder II 1500/500 engine. 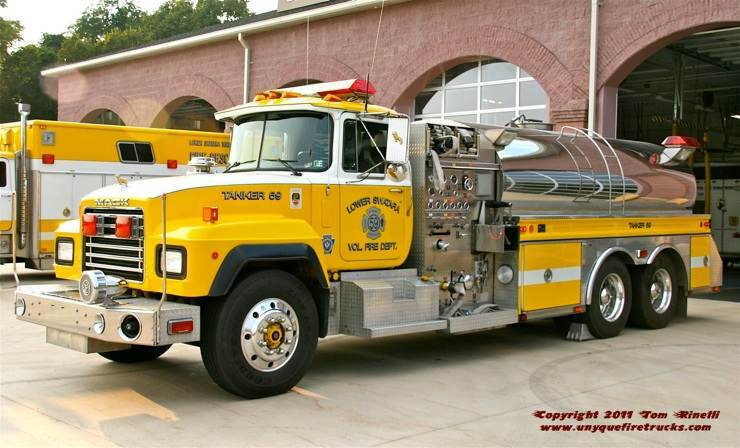 Originally delivered as a canopy cab, the rig was completely refurbished in 2003 by SWAB with the addition of a four door cab enclosure, Conestoga wagon cover, body work & the intakes enlarged to 6” diameter increasing the pump capacity to 1,250 GPM. Seating six, it is equipped with five SCBA with eight spare cylinders, 8 portable radios (400 Mhz/UHF), seven 200’ 1-3/4” pre-connects, a 100’ 1-3/4” trash line, two lengths of 5” hard suction, 200’ of 3” supply line, 1,000’ of 5” LDH & a 30’ 5” pony length as well as three deck guns (two fixed, one portable “Stang” pre-connected with 200’ of 3” supply line), a heat gun and chimney fire kit. 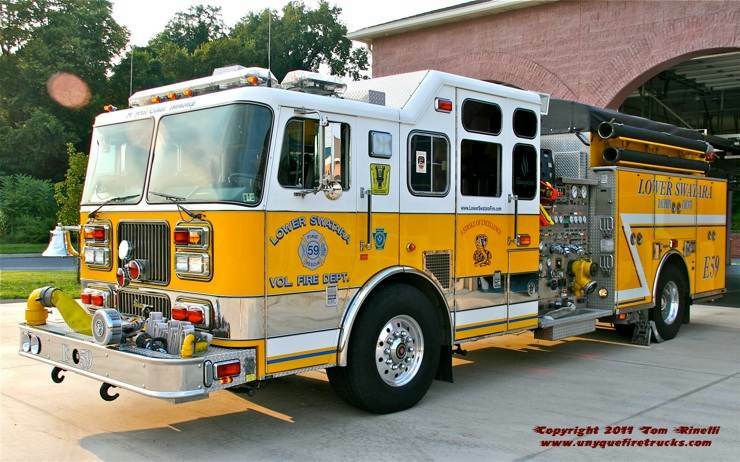 The first CAFS equipped engine in Dauphin County, it was refurbished in 2008 due to numerous issues and an accident that occurred in the manufacturer’s shop during the refurbishment. Operating as the primary structure/rescue engine, it seats eight and features a laptop, 12 portable radios (400 Mhz/UHF), a 200’ electric cord reel, two deck guns, a cab mounted diamond plate box for hand tools and Conestoga wagon cover. Its’ firefighting equipment complement includes (6) 200’ 1-3/4” pre-connects, (1) 200’ 3” pre-connect, 200’ of 3” supply line, 2,000’ of 5” LDH, a front bumper mounted 100’ 1-3/4” pre-connect & 30’ 5” pony soft sleeve, thermal imager, three CO meters, seven SCBA, assorted LDH appliances, high rise hose attack/supply packs, assorted ventilation saws and fans as well as a chimney fire kit. For rescue operations, it is equipped with an Amkus power unit supplying a cutter & combi tool, Sawzall reciprocating saws and BLS medical equipment including oxygen and an AED. Special thanks to Lt. Justin Lenker for his assistance in positioning the rigs for photos & providing background information on the department and its’ apparatus. Occupied in 2008, this modern six bay station features several drive through bays and has living quarters specifically designed for the “live-in” members attending local colleges.